When it comes to regulating different aspects of your business, it pays to make sure that you have a consistent policy that can provide guidelines for your employees. This is true of different elements of any company, be it social media usage, security, or attendance. With respect to attendance, you would need different tools like employee record templates in order to be sure that employees really are putting in all the necessary hours. You may also see HR policies. As with other issues, it is always necessary to have some kind of policy in place to regulate your employees and their attendance. You could see how if you think about how attendance issues affect your business, particularly if consistent tardiness or absenteeism are plaguing your company. In order for this not to happen to you, it would be prudent to be aware of some of the potential uses you could gain from tools like an attendance policy template. 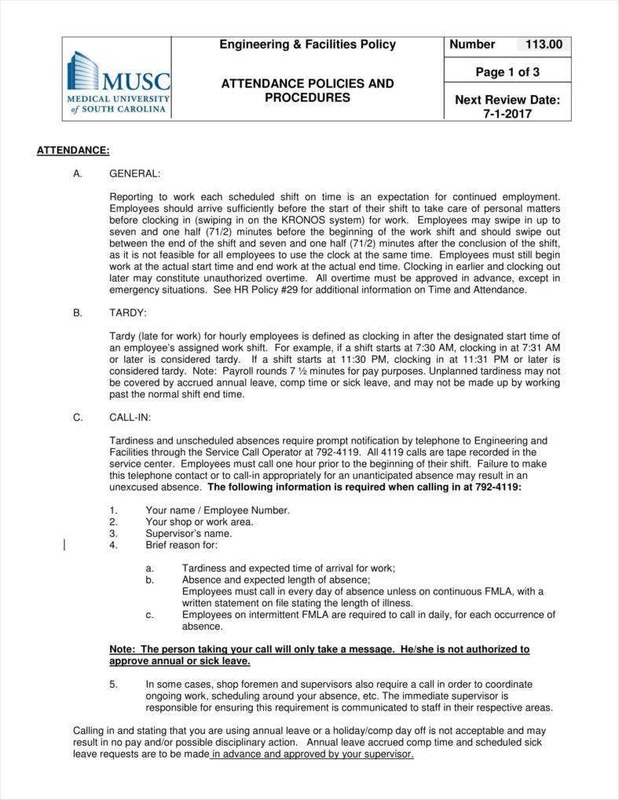 Naturally, the policy is meant to list the guidelines that regulate employee activities—in this case, those pertaining to attendance. As such, a policy can include all the rules such as how many hours each employee is expected to put in and whose responsibility is it to keep track of attendance. This allows each employee to understand all the relevant guidelines so that they can conform to whatever rules the company maintains and ensure that they can make the most of their work hours. Part of having a policy involves listing definitions of terms so that everyone reading the policy can be sure that they have the same understanding of what terms are being used in it. After all, if terms are clearly defined, there could be some level of ambiguity concerning terms such that it could be easier for the unscrupulous to find loopholes. This can be made less likely to happen by spelling out what all the terms are intended to mean in the policy proper so as to keep everyone on the same level of understanding. This can also serve to clear up any points that may not be completely clear, which would be advantageous to you by ensuring that all employees understand the policy in its entirety. Another function of a policy that can help clear it up with your employees is that the policy’s purpose is spelled out clearly. 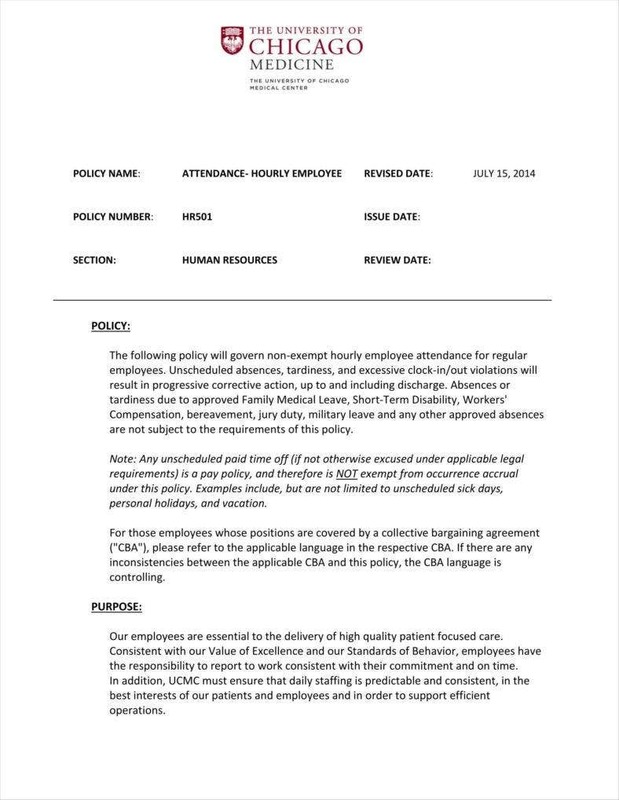 You might have seen this in some policy templates in Word and PDF which clearly state what the policy is intended for with respect to the company and its employees. It can be advantageous to list the purpose of the policy, even if it does seem like something obvious at first glance. For example, this can serve to contextualize the policy in terms of the company’s workforce in order to impress on the employees exactly what the policy is meant to do for them. After all, this can serve to spell out for your employees exactly what the policy is meant to do, which can help them visualize what goals are meant to be served by that particular policy. 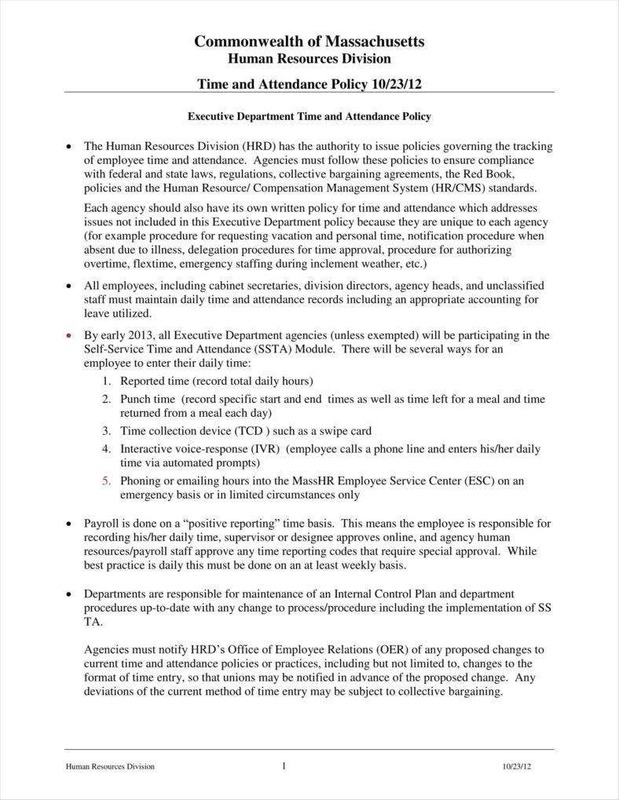 While these policies are meant to regulate employee attendance, that is not to say that it is impossible to be tardy or absent. After all, it would be unrealistic to expect that one’s employees can avoid being absent or late all the time. With that in mind, it is possible for these policies to include exactly what procedures would be necessary to enable employees to absent, which would allow these policies to overlap with leave policies. In the case of lateness, you can include some guidelines for your employees with respect to tardiness. This can include how many minutes constitute an absence, or how many instances of tardiness call for more serious sanctions. Speaking of sanctions, it is always necessary to include the sanctions for any violations of any kind of policy so as to provide employees warning of what to expect in the event that they do violate the policies. The inclusion of these sanctions may also serve to give your employees a chance to improve their behavior on their own without necessarily resorting to the measures themselves. While this can serve as a means of scaring employees straight, so to speak, at its most basic, this function also allows you to keep your sanctions proportionate to the offense. While absences can constitute offenses against productivity, they are not quite serious enough to warrant using the most serious disciplinary measures. 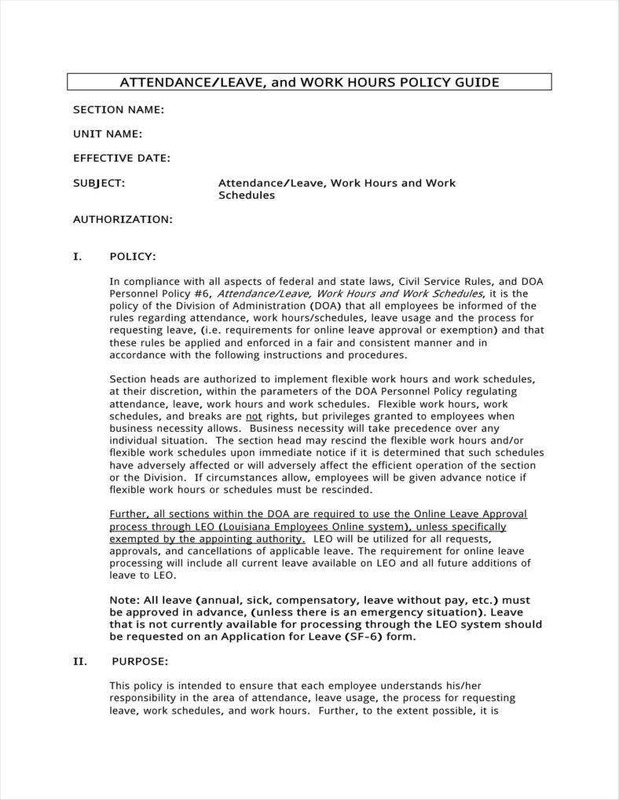 Like other official documents, it is also possible to include the dates on your attendance policies, to say nothing of other examples of printable business policy templates. This can be advantageous to you namely because it allows employees to trace when those policies will come into effect, particularly in the case of new policies or updates to existing policies. After all, a date can serve to keep the document grounded so that employees can be made aware of when it officially becomes policy. 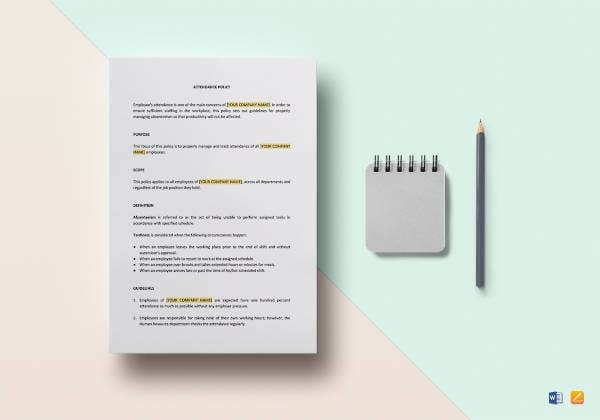 Company policy templates are generally meant to be visible to your employees on a regular basis, which would allow them to be seen at any time. 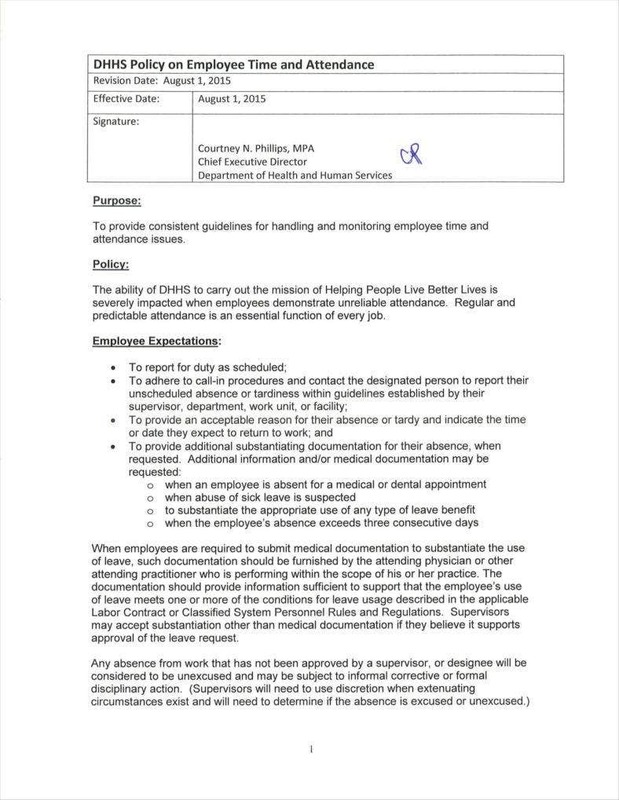 This is a prudent measure for keeping employees informed of what your policy is concerning attendance. After all, no one can claim that they were ignorant of policy if it was out in the open for all to see. This is true of current policy as well as updated ones as employees are free to see them any time they care to. 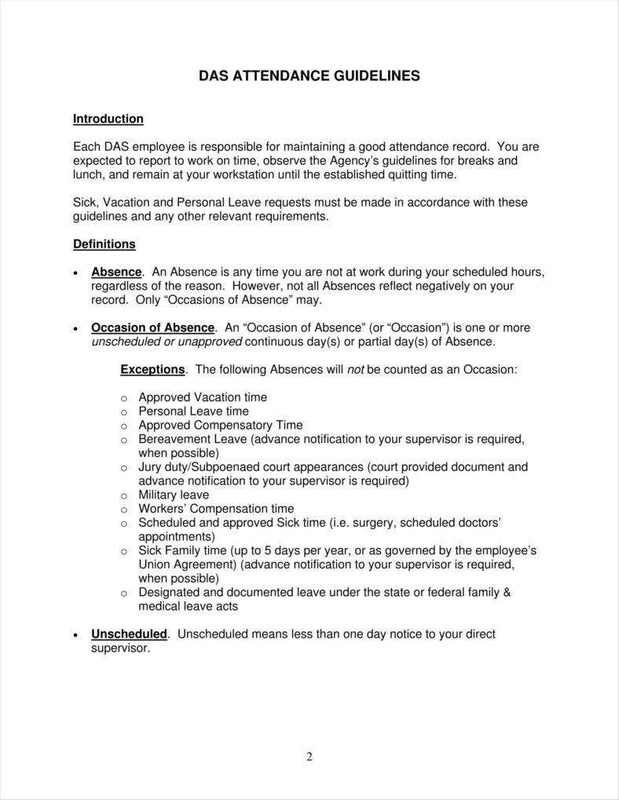 This can also help serve as reminders in case employees need to be reminded of what the company’s stand is regarding attendance. 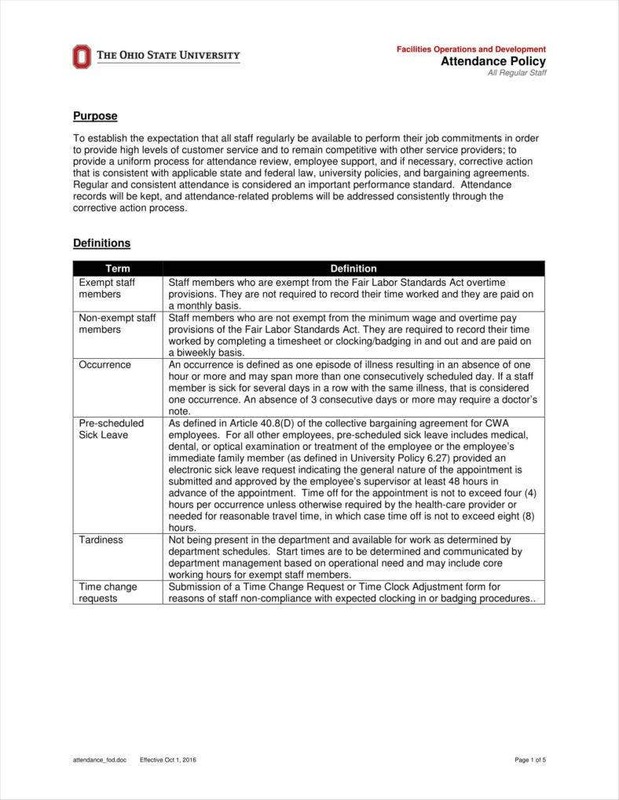 If you are in a managerial position, it might be to your advantage to use different document templates like attendance log templates, not to mention attendance policy templates. However, if you were looking for some specific reasons to use such templates, then you might want to know about the significance of those templates so that you can apply that knowledge yourself. 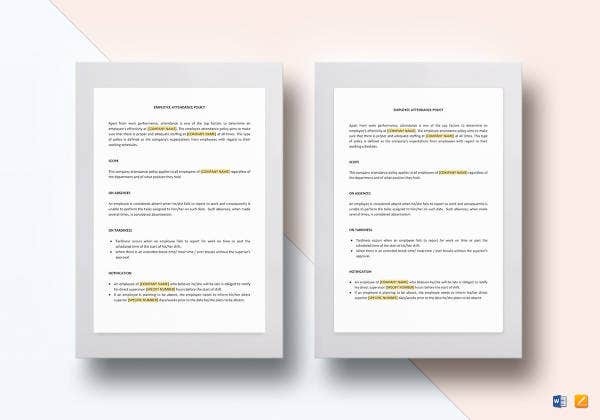 For many managers, it pays to have a document template that can be reused repeatedly, especially if you need to make documents that need to be made over again like letters. 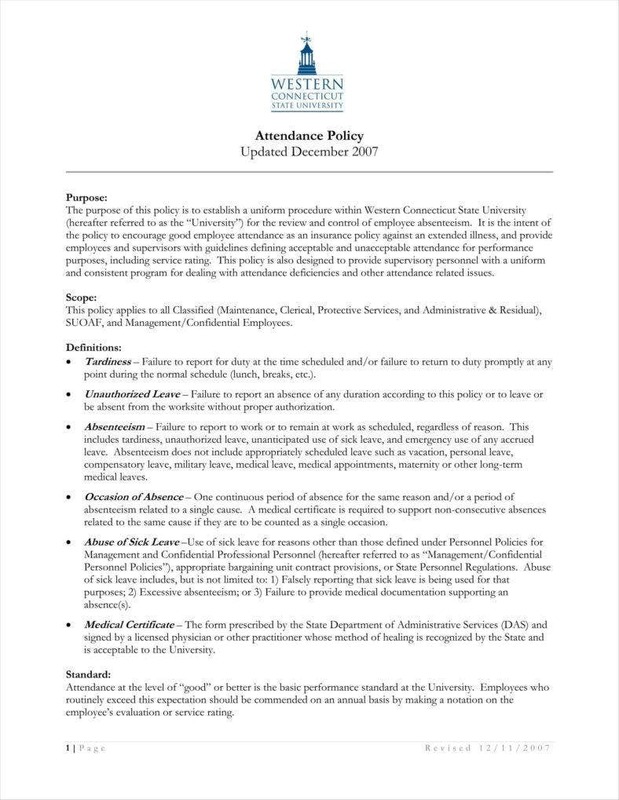 It can still be wise to maintain policy templates in PDF for attendance policies so that you can have an easier time updating your current policy. This can save you time making the policy from scratch as you could simply make the necessary changes to the template proper. This can also make printing out the policy simpler if you want to release a hard copy for distribution. Not every company necessarily has the same policy or approach concerning operations. As such, it might be necessary to customize your own policy to suit the particular needs of your company so that you can get optimal results from the policies. 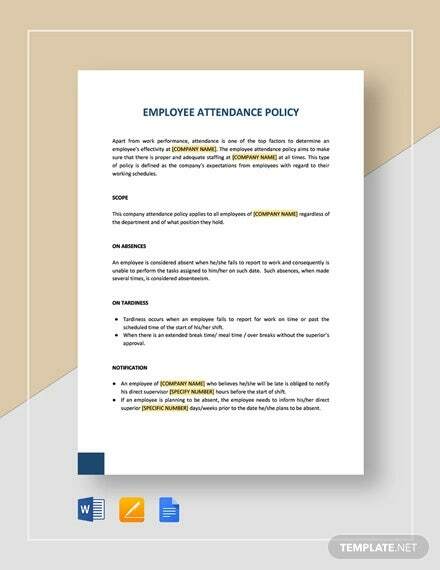 As with other kinds of templates, it is a fairly simple task to edit and rewrite your existing attendance policy template samples so that they can more accurately reflect the actual conditions in your company. 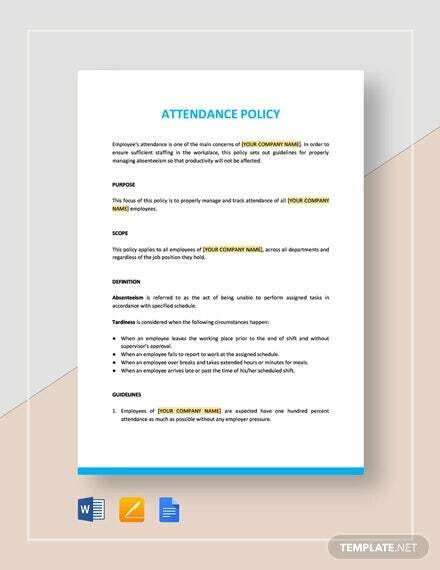 These attendance policy template formats may also be applied to different businesses so that no matter the nature of your own business, you should be able to benefit from these templates. After all, attendance is a general concern shared across different kinds of businesses, so it is only natural that you can find a use for these templates no matter what your business is actually concerned with. All of your official documents would do well to include your company’s letterhead so that they can clearly mark themselves as being officially affiliated with the company. This is a fairly necessary step to make sure that your policy is recognized as having the official backing of the company as a whole. 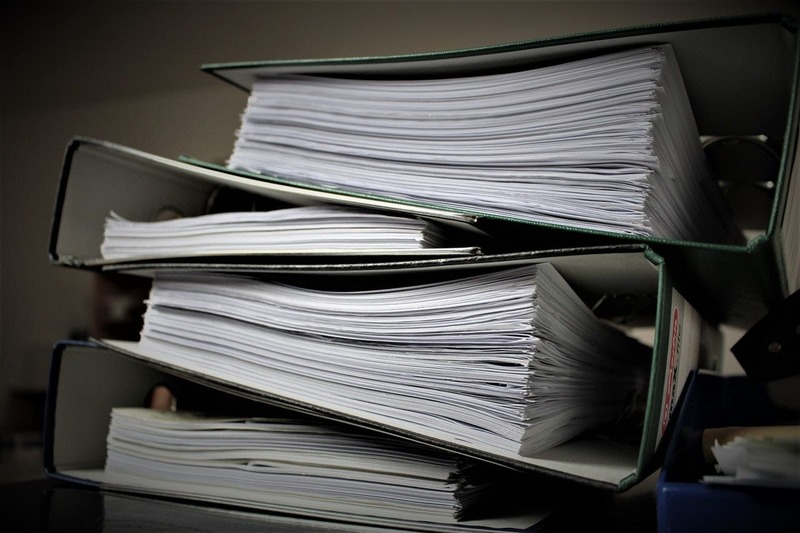 After all, omitting the letterhead can throw the policy’s authenticity into doubt, so it pays to include it simply to make sure that there can be no doubt as to the authenticity of the document. If you are intent on making the policy official, then this would be necessary in order to satisfy any concerns that the policy has been made with all the necessary authority. With any luck, these insights should make the task of making your own attendance policies all the easier. Since company policy, in general, is a fairly vital element of any business, it would be prudent to have all the tools you need to make this kind of task all the easier.